Along with having good boots, waterproofs and base layers, having a decent mid layer is going to make the difference between a happy day in the hills, and a cold miserable one. 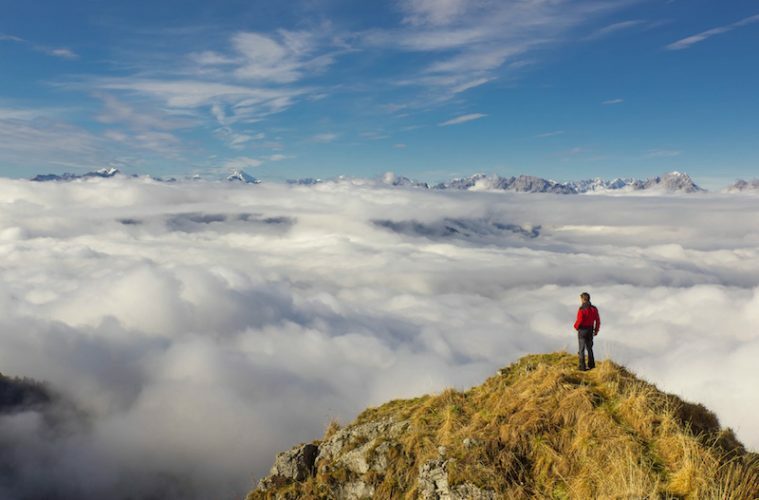 So, when you’re looking at mid layers for hiking, what should you be looking out for? 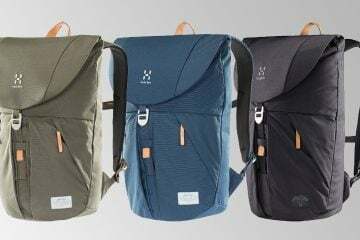 Well they need to be lightweight and packable, so you can chuck them in your bag, they need to be comfortable, have an adequate amount of features that suit your needs (pockets, hem toggle, hood, etc. ), be good value, effectively deal with moisture, fit well and allow a full range of movement. Below, you’ll find our verdict on nine of the best mid layers out there for men. 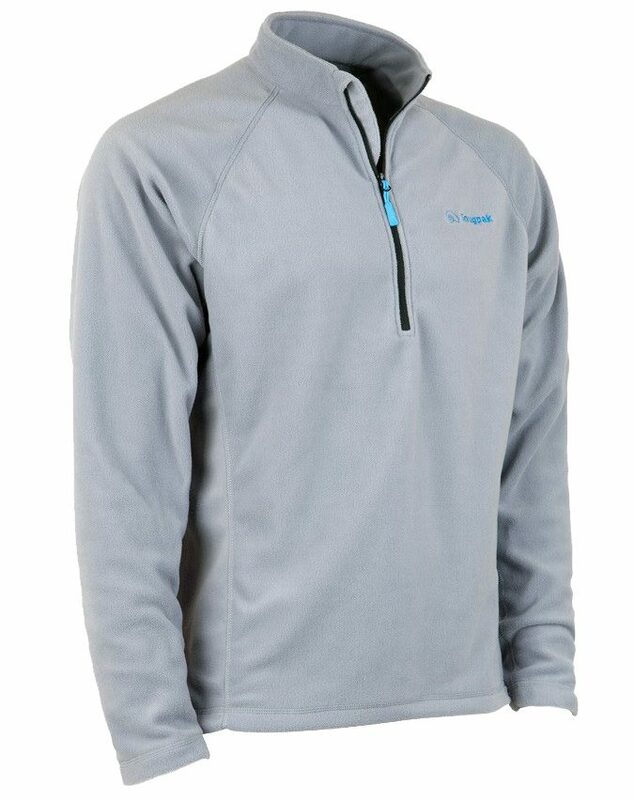 In my time working in the outdoor industry, I’ve come to know Snugpak for making simple, no-fuss gear at good prices, and the Impact Fleece Shirt seems to fit with that ethos perfectly. The first thing you notice is just how soft the material is – I didn’t want to take it off! This seems to translate through to thermal efficiency too, as the fleece is very warm. There were times when things got too hot on the move, but the half-length zip helps cool you down and it’s easy to pull up the sleeves. There aren’t any pockets and there’s no hood. I personally don’t mind the latter, but at least one pocket would have been handy for small items such as a compass or snacks. I also found the garment length was shorter than I would have liked (I’m 6ft 2”) and it left me feeling a bit exposed at times as it would ride up. I felt the pack size and weight (316g in medium) was respectable, and I had no qualms about stuffing it in my rucksack for the day in case it got colder. One thing I would say is that some of the other mid layers offered better temperature regulation, but aside from that, and the length, this is a decent all-rounder. In fact, for £24.95 it’s a bit of a bargain. In a line: A simple fleece that will keep the budget-conscious warm on the hills. 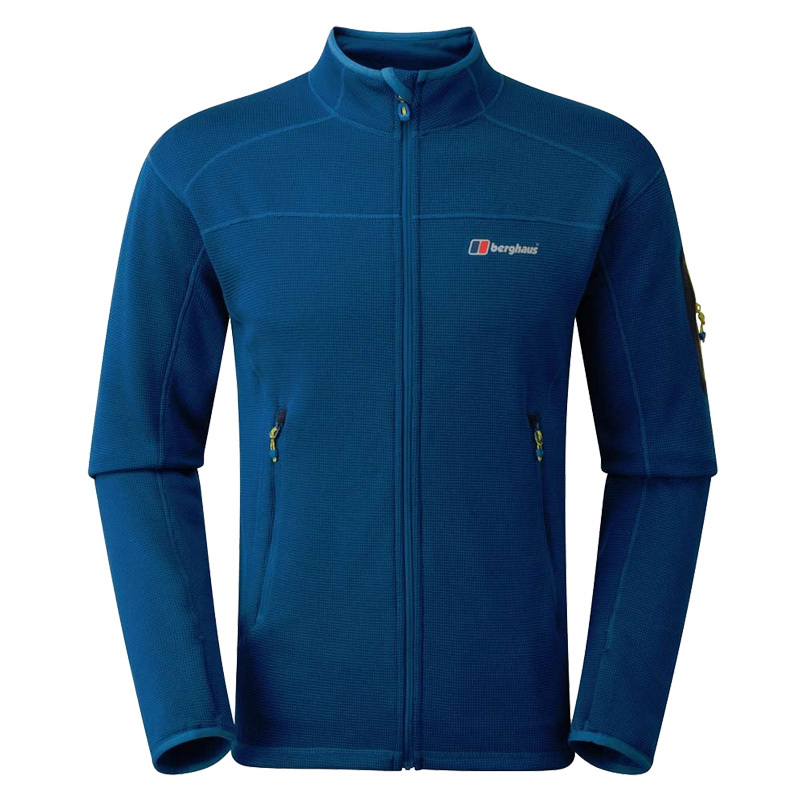 You always know what you’re getting with kit from Berghaus – functional and superbly suited to the British mountains. Well, it seems like they’ve hit the mark again with the Extrem Pravitale 2.0 Fleece. The fleece is lovely and comfortable against the skin, and the fit is spot on too, allowing free range of movement without being too baggy that it lets draughts in. The cuffs are elasticated and they have thumb loops, so there is no issue with them riding up when scrambling. They’ll also roll up without any issues. The body of the fleece is also nice and long. I felt the collar could have been slightly longer, and when zipped up, it can feel slightly restrictive, but this is only a minor gripe. The Extrem Privitale 2.0 Fleece is well-stocked in terms of features. There are two zipped hand-warmer pockets, which are ideal for stashing essentials, and these are accessible while wearing a hip belt, too. There’s an extra pocket on the arm that could be handy for a key or credit card. The fleece is lacking a hood, but not everyone likes them anyway. 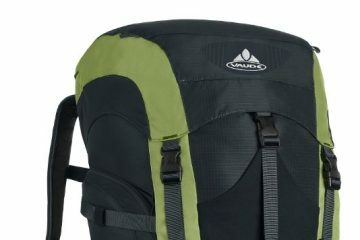 It’s not too heavy (469g in medium), packs down to a reasonable size and should prove a trusty companion in the mountains. In a line: A trusty, fully featured mid layer. 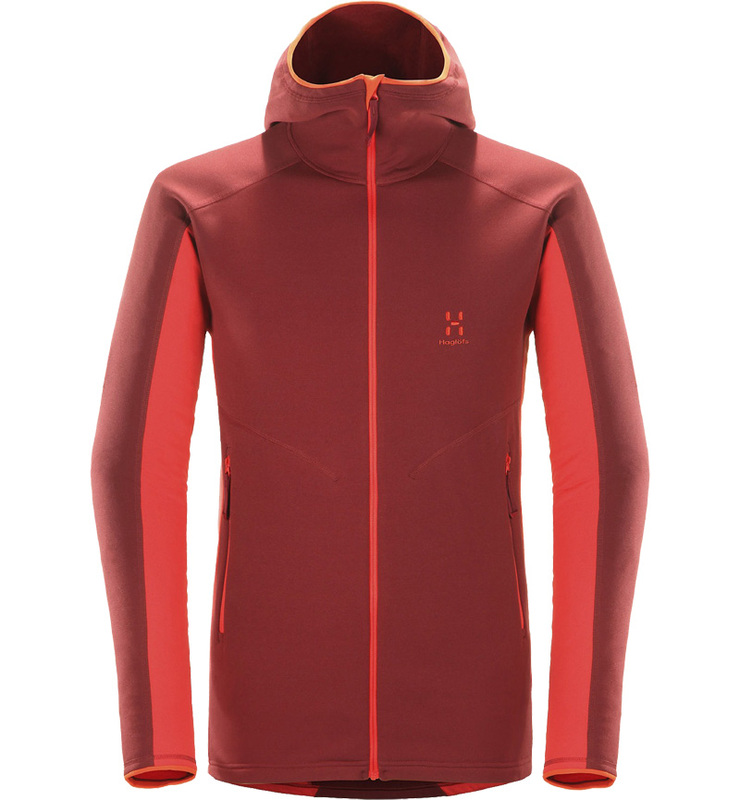 Rab’s entry into this test is the Superflux Hoody, a versatile mid layer designed for active use in the world’s wild places. 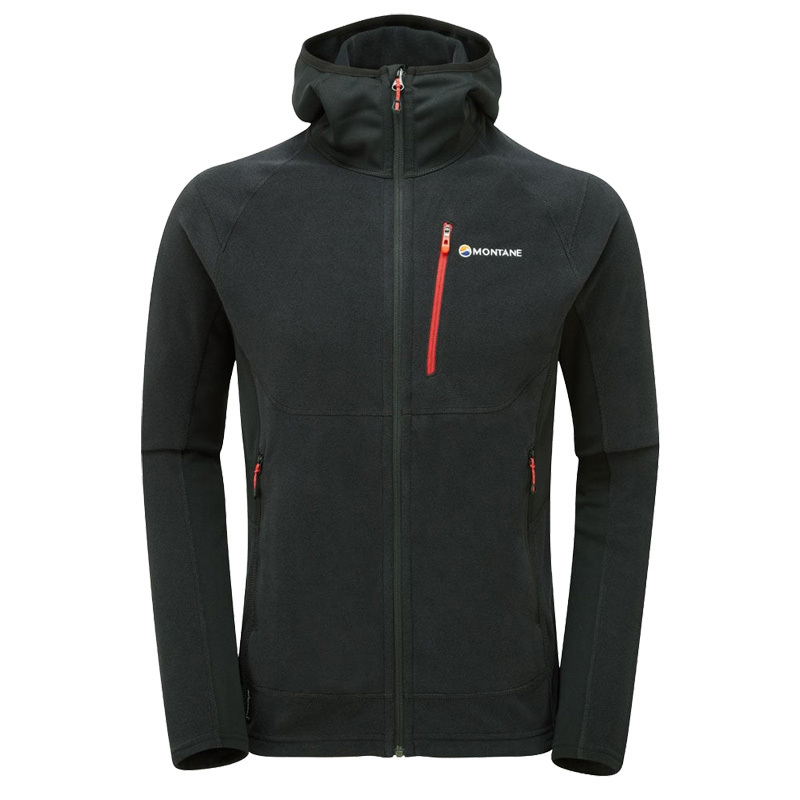 It makes use of Thermic fleece material, which has a brushed back and is very comfortable. It was warm, kept the worst of the wind out and, with the help of the full zip, I didn’t overheat at any point. The garment has a decent amount of stretch, too, so I had a full range of movement and freedom while scrambling. Importantly, the garment and sleeve length are long enough that I wasn’t flashing my belly or wrists at any point either. The feature set is as you would hope, with a zip chest pocket (just big enough to fit an iPhone 6), thumb loops and a close-fitting hood. While the collar offers good protection against the wind, I did find it slightly irritating, as it would tickle the front of my chin. There are no hand-warmer pockets either, which may or may not be an issue for you. One area where the Superflux Hoody especially excels is in its weight (366g in medium) and pack size. It folds down to the size of a small bottle and would very easily stuff into your bag without weighing you down too much. It also looks good and comes in a lovely red, blue and grey. In a line: A good, reliable all rounder that is at home in a range of environments. Highly recommended. 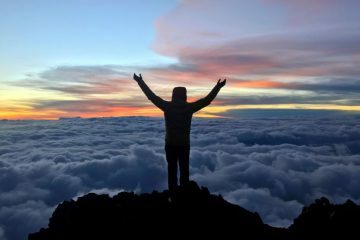 The Fury Hoodie is Montane’s entry into this test and what is immediately apparent is that the Pintetorto Tecnopule fleece material is beautifully soft. Unfortunately, this is slightly mitigated by the seams on the sleeves, which are noticeable when worn against bare arms. This is a minor annoyance, though, and it doesn’t detract much from the overall comfort levels. What the Fury Hoodie does very well is marry performance with practicality. The garment provided ample warmth on a November’s weekend in Snowdonia, and it’s practical too. There are stretch panels on the sides, underarms and hood, which ensure a comfortable and full range of movement. There are also two large hand-warmer pockets and a nicely sized zip chest pocket. Hem toggles ensure you can stop rogue draughts coming in and the sleeves are long and close fitting enough that you’re never exposed when reaching up. Despite being so fully featured, the weight (396g in medium) and pack size are impressive, so this is a jacket we’d happily take on the hills for a day. It comes in a blue, black and green, and is worth every penny of the £95 you’d be spending on it. In a line: A brilliant mid layer that just misses out on top spot. Highly recommended. Designed to be versatile and suit most kinds of activity, the Haglöfs Heron Hood is a mid layer I was particularly looking forward to testing. It’s a good looking piece of kit, coming in some great colour schemes, including red/orange, two tone blue and black. It feels good once you’re in it too, with the fleece material feeling lovely and soft. It’s quite close fitting (in fact, it’s one of the slimmest on test), but the four-way stretch material means movement isn’t hindered at all. I’d say the garment is just about long enough to ensure it doesn’t ride up and the sleeves are a good length too, so I didn’t find any issues with my wrists being exposed much. The close-fitting hood and high collar did a good job of battening down the hatches when the weather erred on the wild side and the close fit meant that there weren’t any draughts creeping up from the bottom. Warmth is on par with some of the other high-end mid layers here, and we had no qualms in that respect. The full-length zip also helps if you start to get too hot. The pack size and weight (400g in medium) is comparable with a lot of the other garments on test, with only the likes of Vaude, Rab and Icebreaker beating it in this regard. In a line: A stylish and lightweight mid layer packed with features. I’m not sure I’ve ever worn anything quite as soft as the Mountain Hardwear Monkey Man Jacket. It feels unbelievably comfortable and once you’ve got it on, you really don’t want to take it off. 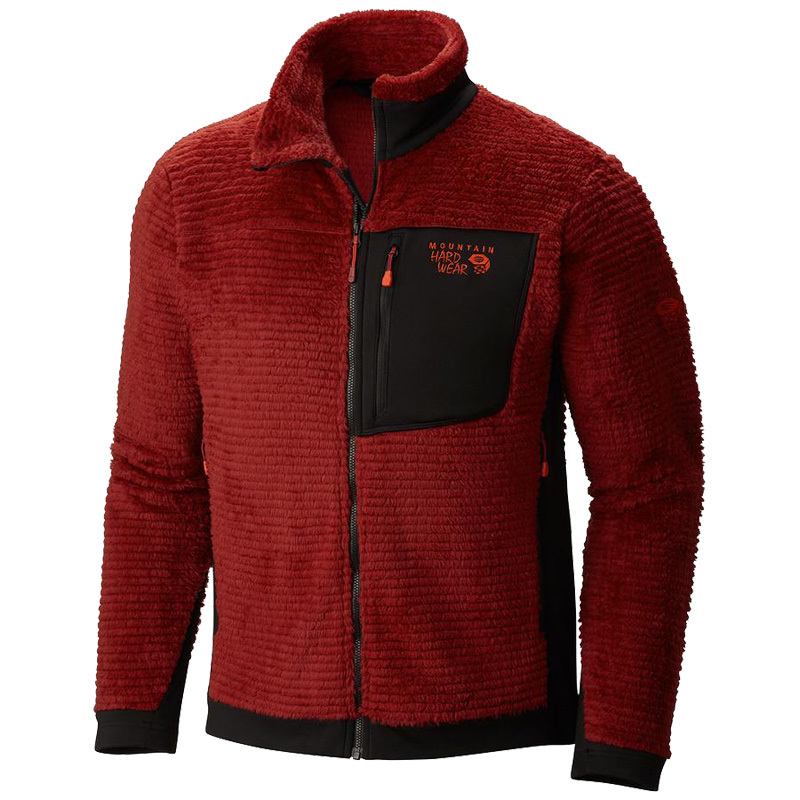 The jacket makes use of Polartec’s High Loft fleece material, which is not only incredibly soft, but is also very warm. At times, maybe too warm. This is great news if you feel the cold, but if you tend to run hot you may want to consider another option (or just keep the zip open!). I would describe the fit of the Monkey Man Jacket as relaxed. Movement is unhindered and the sleeves are long enough to ensure you aren’t left too exposed when reaching up. Despite the relaxed fit, the hem is elasticated, so there shouldn’t be any cold air flowing up from the bottom. Features include two zipped hand-warmer pockets, a zip chest pocket and stretch side panels which help aid breathability. The collar also rises up nice and high, offering great coverage on the neck and chin. In a line: One of the most comfortable pieces of clothing I’ve ever worn. Salewa’s entry into this test is the Pedroc 2 Hybrid. It’s different to many in this test as it’s more of a thin soft shell as opposed to a fleece or warm mid layer. As such, many of the others offer greater levels of warmth. The Pedroc 2 Hybrid isn’t brilliant in that respect, but it does offer you an alternative. You wouldn’t buy it as a thermal layer, but where it does excel is in fast and light circumstances. It packs down to the size of a small water bottle and weighs just 264g (in medium), so it would barely be noticeable in your pack. You can hardly tell when it’s on, too. It’s comfortable to wear and does a fair job of keeping wind and light rain off, though we’d use an extra layer underneath if things were particularly wild. If you’re moving fast, are not stopping too much and want to stay light, it will do a good job. 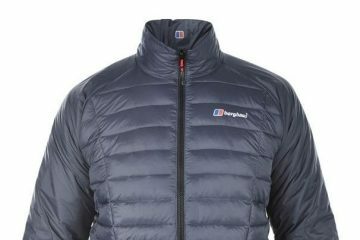 For such a lightweight piece of kit, it has some great features, including a zip chest pocket, a close-fitting hood and elastic cuffs. The sleeves are long enough to ensure they don’t ride up, but we would have liked a longer length to the garment. It comes in a range of attractive colours, including black, blue, yellow and green. In a line: A great option if you’re going to be travelling fast and light. You probably know Icebreaker best for its quality merino base layers, but the brand also produces a range of other garments. Having spent some time with the Descender, I can confidently say that the quality carries over to mid layers. It’s incredibly comfortable for a start. This is because it is brushed for extra softness and it has a perfect amount of stretch, so you never feel restricted. The stretch also helps provide a great fit and I had no issues with cold draughts entering from the bottom or on the arms. I loved the long cut of the top, and the thumb loops on the arms meant my wrists were always covered. It also offered great levels of warmth, with the 240 weight merino wool doing its job well. Feature wise, there are two generously sized hand-warmer pockets and a chest one complete with a hole for your headphones to thread through. The collar was also particularly comfortable and just the right size to keep the elements out. A lack of hood might bother some, and the zip pulls are quite small, so you’d really struggle to operate them with gloves on. 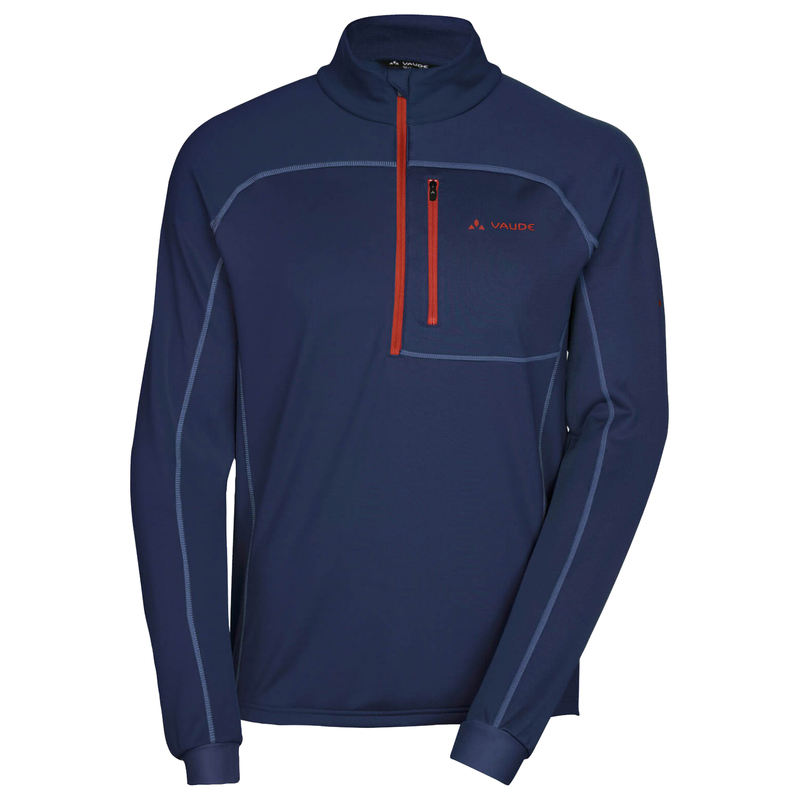 Generally speaking, this is a great mid layer, especially as it packs down small and is pretty lightweight (392g in medium). The price definitely reflects that though. In a line: A great mid layer with an eye-watering price to match. I’m a big fan of Vaude. Everything I have tested from the brand has performed to a high level, and after using the Boe Halfzip for a while I’ve come to realise that this mid layer does exactly that. 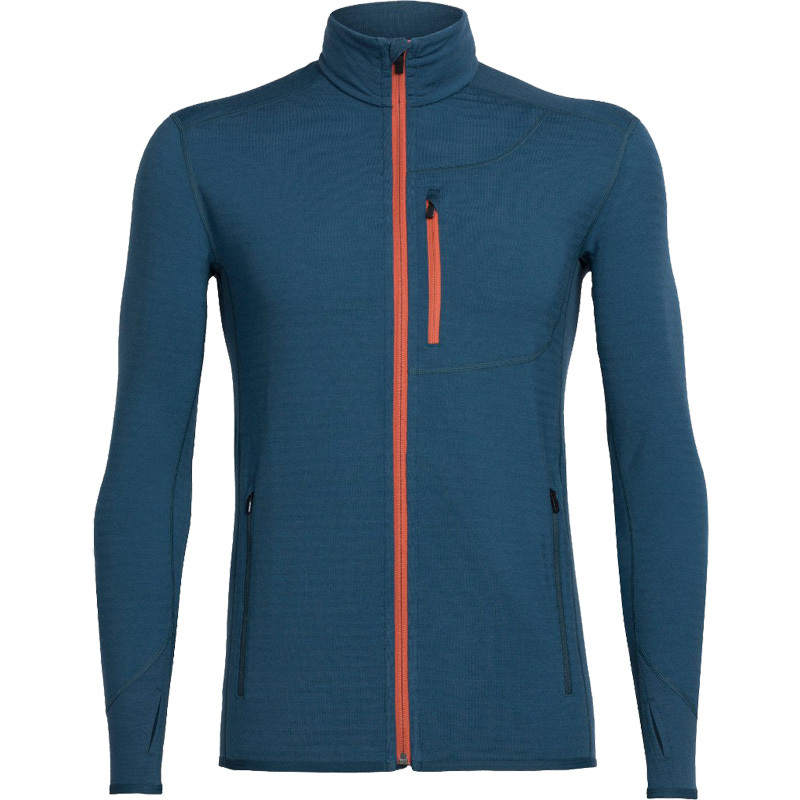 It may not be the most comfortable mid layer on test, but it’s no slouch either. Some of the others offer that instant cosy feel, and while that isn’t the case with this top, it certainly reaches similar levels of comfort after you’ve had it on for a short amount of time, and from then on you hardly notice it. 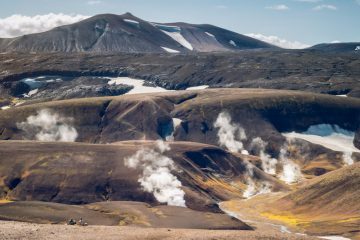 I found the thermal regulation to be top drawer and on an exposed, windy ridge it cut out the harsh breeze and kept me warm, but not too hot, throughout the day. The deep half zip certainly helped with this (I tend to run hot). The fit was spot on, the material had enough flex to ensure a full range of movement, and the cut of the garment was a good length. In fact, the sleeves were plenty long enough too, and at no point did I feel my body parts were exposed while scrambling. Although there were no thumb loops, the elasticated cuffs helped do a good job of eliminating the risk of cold draughts, and I actually felt they were the best cuffs on test in that respect. 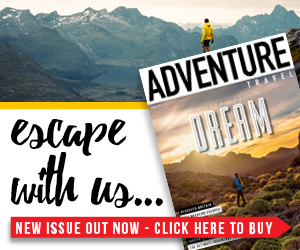 Extra features include a zip chest pocket, which is handy for keeping a phone (an iPhone 6 easily fits in) or compass, and a comfortable, perfectly sized collar that kept out the elements without irritating your chin or neck. One issue I did find with the Boe Halfzip is that the odour resistance left a little to be desired, and so it had to be washed very regularly, especially if you’re working hard. Having said that, this isn’t an issue that’s simply limited to this garment, and apart from the merino wool Icebreaker, most mid layers on test are guilty of it to some extent. The other slight moan is that the zip pulls could do with being bigger, as they are a bit fiddly with gloved up hands. One of the key things about the Boe Halfzip is that it packs down really small and is one of the lightest on test (283g in medium). This means you hardly even notice it while it’s packed away which is great for summer, when you might only need it when you’ve reached exposed terrain. In autumn and winter it does a good job too, and with an extra windbreaker or waterproof jacket is should keep you nice and warm on particularly cold days. 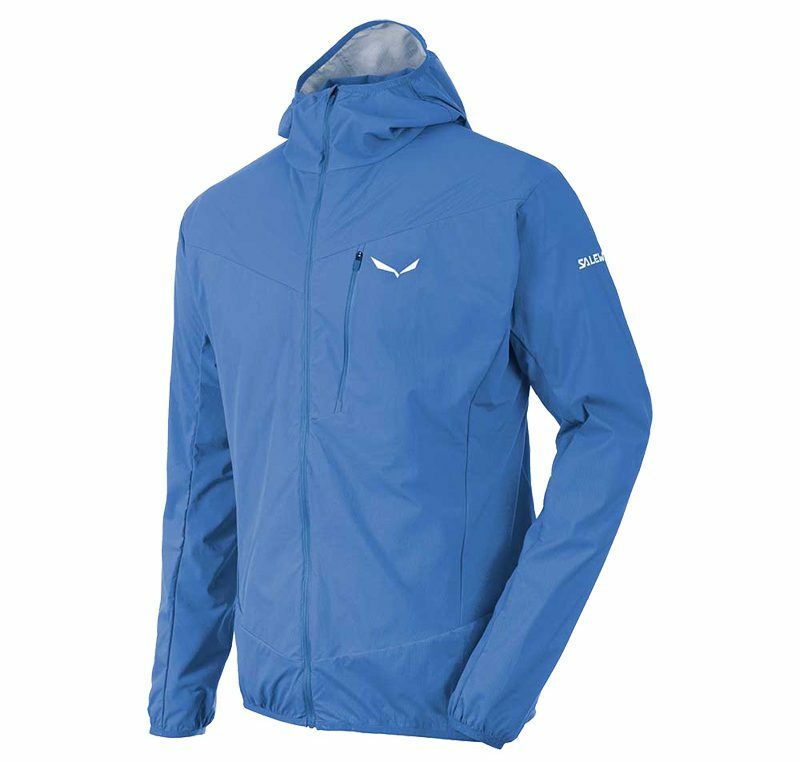 In a line: If you’re not bothered about having a hood, the Vaude Boe Halfzip is a solid, comfortable and reliable option. Best in test. 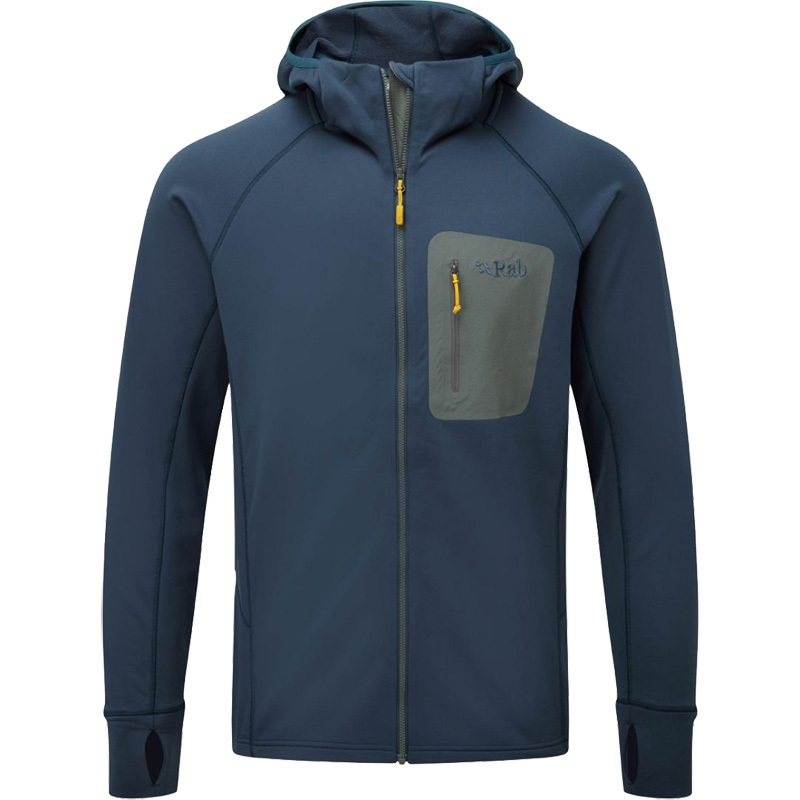 WIN a Rab Microlight Alpine Jacket worth £190!